“Dedicated to giving modern premieres of the wild instrumental music of the seventeenth century,” ACRONYM is itself an acronym for its fanciful moniker, “Altmusik Collective Resurrecting Obscure Nuanced Yesteryear’s Masterpieces.” The ensemble is largely made up of musicians who have passed through the Oberlin Conservatory’s Historical Performance Program. 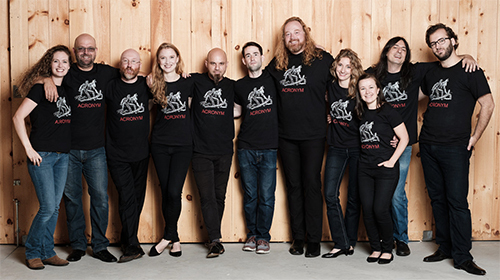 Its members can also be heard performing in such period and modern instrument groups as Cleveland’s Apollo’s Fire, Toronto’s Tafelmusik, Boston’s Handel and Haydn Society, the Boston Early Music Festival, the English Concert, the International Contemporary Ensemble, and Chicago Lyric Opera. Formed in 2012 for the project of recording Johann Pezel’s Alphabet Sonatas, ACRONYM has released other critically acclaimed recordings including Samuel Capricornus: The Jubilus Bernhardi Collection; Johann Rosenmüller in Exile (with baritone Jesse Blumberg); Oddities and Trifles: the Very Peculiar Instrumental Music of Giovanni Valentini; Wunderkammer (Cabinet of Curiosities, music by Capricornus, Adam Drese, Johann Philipp Krieger, and others); Paradise (sonatas by Antonio Bertali); and Valentini: Secondo Libro de Madrigali, with Les Canards Chantants (the quirky vocal ensemble whose name means “The Singing Ducks”). Those recording projects reveal both the scholarly and the winsomely humorous sides of ACRONYM, characteristics that are embodied in cellist and gambist Kivie Cahn-Lipman, a founding member of the period band as well as of the International Contemporary Ensemble. 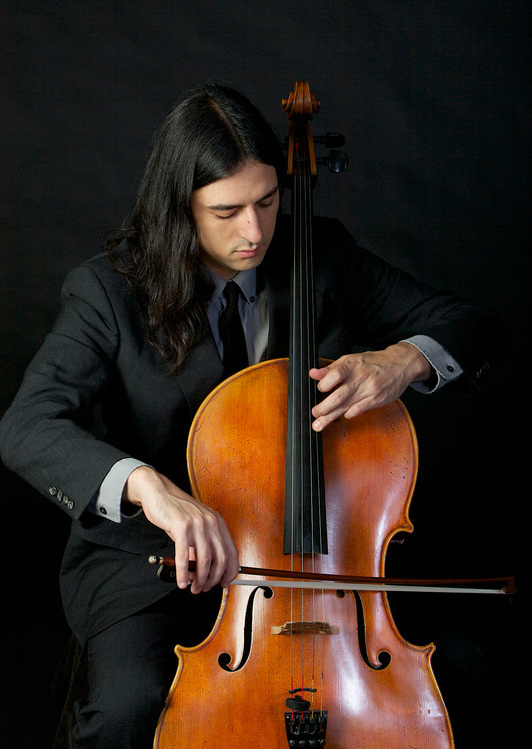 Lipman also serves as assistant professor of cello at Youngstown State University, and has provided us with his program notes for ACRONYM’s October 5 concert. Programmatic battle music has long been popular, from Renaissance polyphony in which singers imitate gunfire and cries, to Romantic-era orchestral works which feature actual cannon in the percussion section. Many seventeenth-century pieces of German battle music referred to military conflicts between the Holy Roman Empire and the Ottoman Empire, which by then had been taking place periodically for more than three hundred years. Perhaps the most famous work of Baroque battle music is the concluding piece on our program, composed by H. I. F. von Biber, an Austrian composer who worked in Graz and Kroměříž before settling in Salzburg. Biber’s Battalia (1673) is in eight continuous movements and dedicated to the god Bacchus. A brief untitled introduction is followed by Die liederliche gesellschaft von allerley Humor (the dissolute company of all sorts of humor), in which eight contemporaneous folk songs are heard simultaneously in different keys, and a note in the manuscript reads: “hic dissonat ubique nam ebrii sic diversis Cantilenis clamare solent” (here is dissonance everywhere as drunks shout out various songs). This cacophony is followed by two untitled presto movements, with Der Mars (the god of war) between them. A gentle aria is a respite but segues directly into Die Schlacht (the battle). Der Mars and Die Schlacht each explicitly call for extended string techniques rarely heard until the twentieth century: striking the strings with the wood of the bow, threading paper between the strings to produce a rattle, and snap pizzicato. Battalia ends with an Adagio: Lamento der verwundten Musquetir (lament of the wounded musketeer). Not all battle music was labeled as such. Sonata Jucunda (“delightful sonata”), written by an unknown composer, prominently features a Turkish-sounding melody and battle motifs. Like Battalia, Sonata Jucunda survives in manuscript at the library of the Czech castle at Kroměříž, the source for most of Biber’s extant output. Although it is often attributed to Biber, some scholars have suggested that the likelier composer was Johann Heinrich Schmelzer, Biber’s fellow Austrian who rose through the musical ranks of Vienna before succumbing to the plague. This program opens with another anonymous Kroměříž work which we have speculatively ascribed to Biber: a Sonatina which begins a suite for viola da gamba and continuo, previously attributed to Augustinus Kertzinger. A major turning point in the lengthy conflict between the Ottoman and Holy Roman Empires took place at the Battle of Vienna on September 12, 1683, and it was a decisive victory for the Habsburg dynasty. Turkish forces had besieged the city for several months before being routed with tremendous losses, thanks to Polish imperial reinforcements. Court organist Alessandro Poglietti, renowned for his counterpoint and programmatic keyboard music, was killed during the siege. The battle was commemorated by Schmelzer’s son, Andreas Anton Schmelzer, who arranged a violin sonata by Biber (the tenth Rosenkranz Sonata, known as The Crucifixion) and retitled it as Die Türkenschlacht bei Wien 1683. ACRONYM has further adapted the variation movement of the sonata for today’s performance. Its six sections are titled: The Turkish Siege — March of the Imperial Reinforcements — The Turkish Advance — The Prayers of the Viennese — The Turkish Assault — The Imperial Victory. We include on this program some favorite works from seventeenth-century Vienna, and in keeping with our Battle theme, several of these are written for “dueling choirs” of instruments. Giovanni Valentini was serving in a minor post as an organist at Graz when his employer was elected Holy Roman Emperor Ferdinand II. Only a few years after arriving in Vienna, Valentini was appointed imperial Hofkapellmeister, the highest musical rank in German-speaking lands. He was one of a series of Italians who would hold this position over the next several centuries, and he was succeeded by violinist Antonio Bertali. Both Valentini and Bertali were teachers as well as composers, and one of their most prominent pupils was Samuel Friedrich Capricornus, a Czech composer who studied in Vienna before winning a post in Stuttgart. Adam Drese held positions in a large number of cities; through his extensive travels, he is credited with spreading the Italian style of composition throughout German-speaking lands. Johann Christoph Pezel was a municipal trumpeter in Leipzig and the only composer on this program unconnected to Vienna. His Ciacona (a type of dance which repeats the same bass line with variations) is the piece which first brought ACRONYM together. Published on ClevelandClassical.com September 25, 2018.